Spent all your money on upgrading your computer equipment and all that is left for your new monitor is $100? Don’t worry – nowadays, you can get a cool-looking 1080p monitor with an IPS panel for under $100; in fact, there are a few to choose from! Check out the top five best gaming monitors under 100 USD available right now as well as everything you need to know about them. 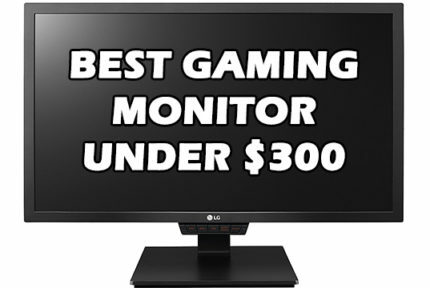 In case you want to invest in a bit more expensive monitor, check out our best gaming monitor under 150, under 200, and under 300 guides. The following displays are the best gaming monitors for 100 dollars or less currently available. 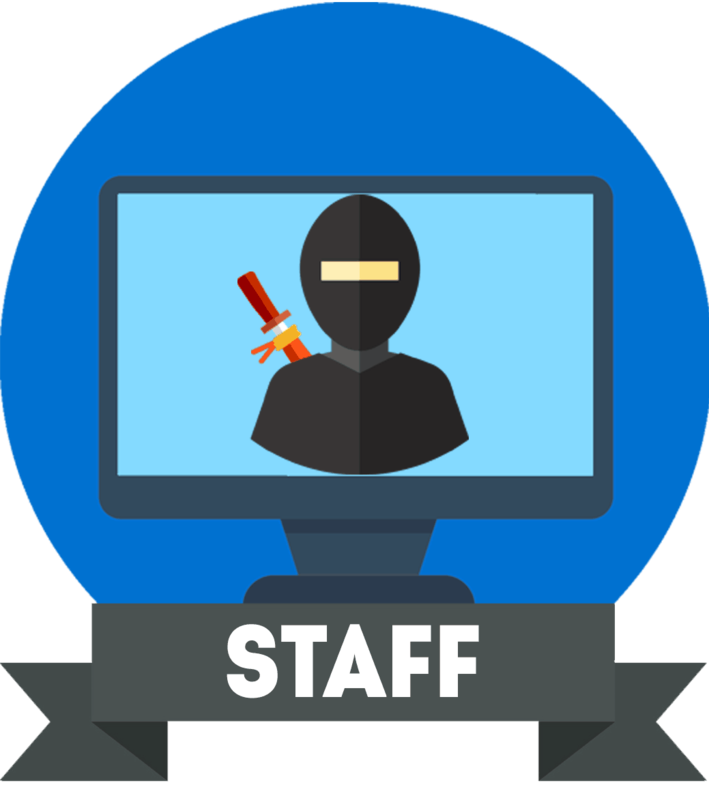 Take note of our guidelines and tips because each monitor is a little bit different and only one is the perfect fit for you. Therefore, make sure that the monitor you pick has the right panel type, response time speed, and other features for your preference. The Acer SB220Q is, without question, the best monitor for gaming under 100 USD. It features a 21.5-inch 1080p IPS display for a vibrant and crisp image quality while the quick 4ms response time, 75Hz refresh rate, and AMD FreeSync guarantee smooth performance. Most monitors under 100 USD have 22″ screens, or to be more precise 21.5″ viewable displays, and those with larger screens usually compensate for it by excluding certain features or by having weaker specifications. This makes the Acer SB220Q the best 22″ monitor under $100 overall. The IPS panel of the monitor features wide 178-degree viewing angles ensuring that the picture won’t shift in color when you’re looking at it from different angles. Furthermore, the panel’s 4ms response time speed efficiently eliminates ghosting and motion blur in fast-paced games. Lastly, the colors are vibrant and accurate which along with the Full HD resolution make for an immersive image quality and eye-catching graphics in video games as well as everyday use. If you have a FreeSync-compatible AMD graphics card or an Xbox One, you will be able to use the full potential of the monitor. 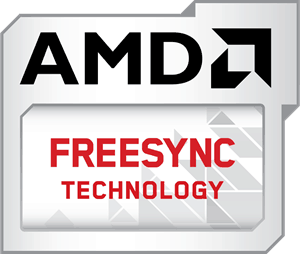 AMD FreeSync synchronizes the display’s refresh rate with the GPU’s frame rate and allows monitor’s refresh rate to change dynamically. As a result, all screen tearing and stuttering is gone for good as long as your FPS (Frames Per Second) rate stays within the dynamic refresh rate range of 48-75Hz/FPS. 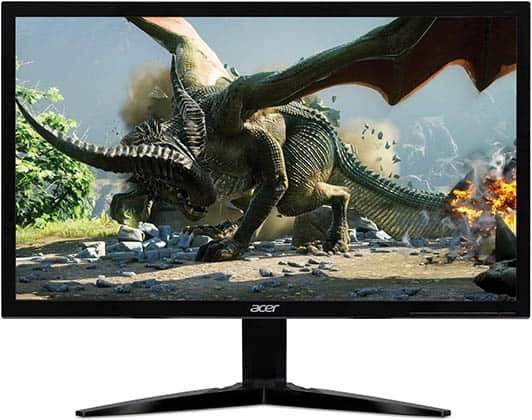 Note that the Acer SB220Q is the cheapest FreeSync gaming monitor! In case you have an NVIDIA card, you will still be able to use the monitor up to 75Hz, but not the dynamic refresh rate technology. The Acer SB220Q 75Hz gaming monitor offers additional gaming features including ‘Aim Point’ which allows you to place one of the three crosshairs on the screen for better precision in FPS games. Next, ‘Black Boost’ increases visibility in dark games, ‘OverDrive’ increases the response time speed, and finally, there are three pre-calibrated picture presets for different gaming genres including Action, Racing, and Sports. The Acer SB220Q bi boasts a beautiful slim design with ultra-thin bezels making an ideal choice for multi-monitor setups as well. Connectivity includes one HDMI and one VGA port; for FreeSync, you will need to use the HDMI port. Alas, the monitor does not support VESA mount and it’s tilt-only, but at this price point, after considering its image quality, performance, and all the features it offers, it’s forgivable. The HP 22cwa is the most popular monitor under 100 USD but in comparison to the Acer SB220Q, it’s not better – and here’s why. With the HP 22cwa monitor, you will get the same image quality you’d get with the Acer SB220Q. 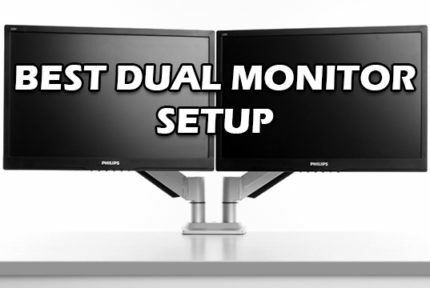 Both monitors feature IPS panels with the 1080p resolution and 178-degree viewing angles. However, the HP model has a response time speed of 7ms whereas the Acer has a faster pixel transition time of only 4ms. What’s more, the HP 22cwa is limited to 60Hz and has no exclusive gaming features. Just like the Acer SB220Q, the HP 22cwa is not VESA mount compatible, it’s tilt-only, and has one HDMI and one VGA port. We find that the main reason the HP 22cwa is more popular is that Acer’s monitor is a newer and less known model. 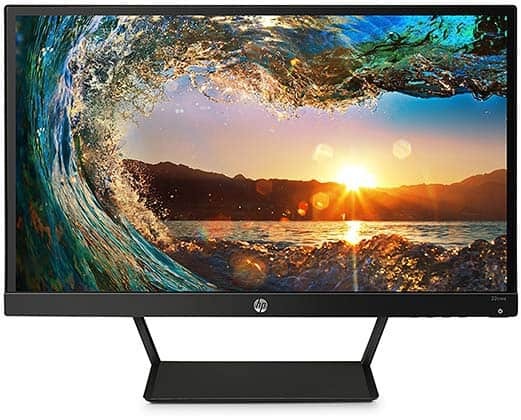 If you don’t care for the 75Hz refresh rate and the gaming features including FreeSync and you prefer HP’s design, you wouldn’t lose anything by going for the HP 22cwa – but you would be paying the same price for an overall lower-quality monitor. Note that some of the following monitors are only under $100 when on offer/sale; otherwise, they are available for slightly over $100. The Acer KG221Q is essentially a TN-panel version of the Acer SB220Q. So, you get a faster response time speed, but worse viewing angles and color reproduction. If you are primarily a competitive gamer playing fast-paced FPS and/or racing games who can’t afford a 144Hz gaming monitor, the Acer KG221Q is your cheapest alternative. With a 75Hz refresh rate, you get a slight but noticeable boost in motion clarity in comparison to the standard 60Hz monitors while the rapid 1ms response time speed ensures there’s no ghosting or trailing of fast-moving objects in games. TN panel viewing angles are 160° vertically and 170° horizontally meaning that the picture will shift in color/contrast when it’s viewed from skewed angles. However, if you are in front of the screen, this won’t affect you. 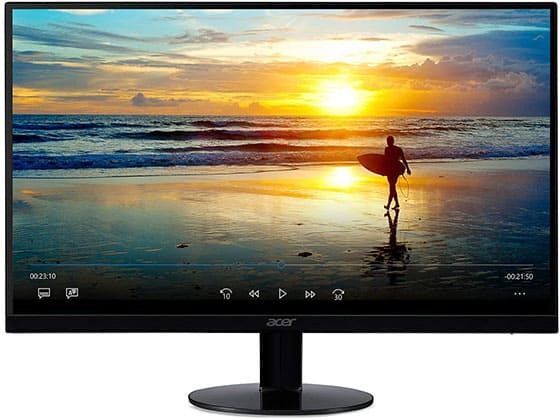 All the features available in the Acer SB220Q can also be found in the Acer KG221Q including AMD FreeSync (48Hz-75Hz dynamic range), Black Boost, Aim Point, and OverDrive. The Acer KG221Q is also tilt-only, but it’s VESA mount compatible so you can effortlessly install it on the wall or a mounting arm. Moving on to the connectivity, there’s a VGA and an HDMI port as well as two integrated speakers for basic sound output. All in all, the Acer KG221Q is the best 22″ 1080p 75Hz 1ms gaming monitor for $100. At this price point, you can also get a monitor with a VA panel which offers a higher contrast ratio for deeper black colors making it the best $100 monitor for watching movies. Thanks to its superior static contrast ratio of 3,000:1 as opposed to 1,000:1 of IPS and TN monitors in this list, black colors will be truly black providing you more clear details in the shadows. The VA panel of the BenQ GW2280 also supports true 8-bit color depth and offers wide 178-degree viewing angles. The response time speed amounts to 5ms, however, motion blur is more noticeable than on other panels, particularly when the image involves a lot of dark pixels. 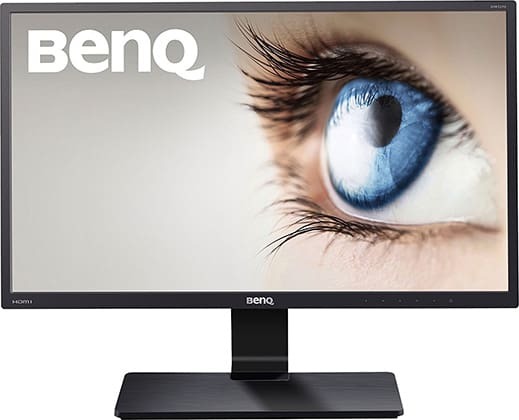 The BenQ GW2280 1080p monitor features two HDMI ports and one VGA port as well as two 1W integrated speakers. You can tilt the screen of the monitor by -5/20 degrees and it’s VESA mount compatible with 100 x 100mm pattern. Looking for the biggest good monitor you can get for under $100? You won’t be disappointed by the Dell E2318HX, a 23-inch 1080p monitor with an IPS panel! The Dell E2318Hx monitor is based on an IPS panel with 178-degree viewing angles, a 5ms response time speed, and a 60Hz refresh rate. So, it’s great for casual gaming and everyday use. We highly recommend this monitor over the 24-inch models by Sceptre and Planar that you can find under $100. 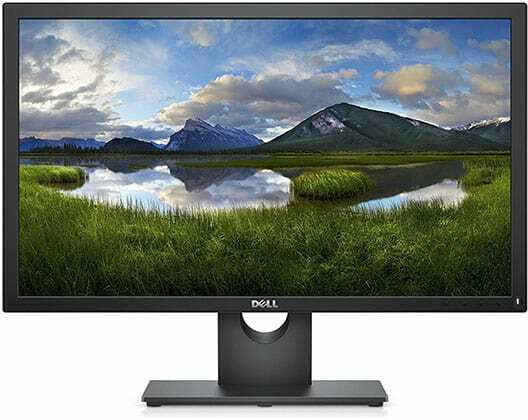 The difference in that one inch won’t be that noticeable, but the superior IPS panel of Dell’s monitor will certainly provide you with a better image quality. If you really want a 24-inch monitor, you should invest at least $20 more for the best gaming monitor under 120 USD. The Dell E2318Hx IPS monitor features a simplistic and elegant design which will suit any environment. It’s VESA mount compatible and the screen can be tilted by -5/21 degrees. Connectors include an HDMI and a VGA port. The truth is, any of these monitors are worth more, so rest assured you won’t be disappointed. We highly recommend the Acer SB220Q due to its plethora of features for gaming, stylish design, crisp image quality, smooth performance, and vibrant colors. If you exclusively play FPS games such as CS: GO, Overwatch, Quake, etc, then the 1ms response time speed of the Acer KG221Q will suit you better but keep in mind the downsides of TN panels. In case you want true black colors and high contrast, go for the BenQ GW2280. And finally, if you want a bit bigger screen, the Dell E2318HX is for you.